Dirty Dancing is a 1987 romance film made in the United States. Written by Eleanor Bergstein and directed by Emile Ardolino, the film features Jennifer Grey, Patrick Swayze, Cynthia Rhodes, and Jerry Orbach. The story is a coming of age drama that documents a young débutante's rebellion against her father by starting a relationship with a dance instructor during a family summer vacation. Almost a third of the film involves dancing scenes choreographed by Kenny Ortega (later famous for High School Musical), and the finale has been described as "the most goosebump-inducing dance scene in movie history". Originally a low-budget film by a new studio and with no major stars, Dirty Dancing became a massive box office hit. As of 2007, it has earned $213.9 million worldwide. 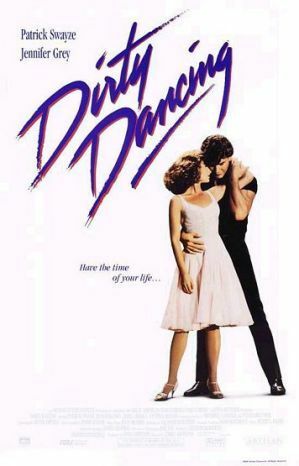 It was the first film to sell more than a million copies on home video, and the Dirty Dancing soundtrack generated two multi-platinum albums and multiple singles, including "(I've Had) The Time of My Life", which won both the Golden Globe and Academy Award for Best Original Song, and a Grammy Award for best duet. The film spawned a 2004 prequel, Dirty Dancing: Havana Nights, as well as a stage version which has had sellout performances in Australia, Europe, and North America, with plans to open on Broadway.